Play areas, bus stops, small plazas or just some benches to take a break. 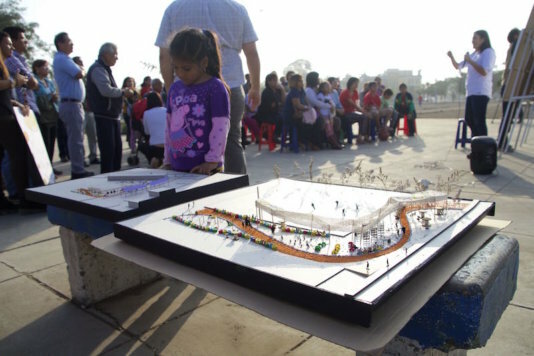 A citizen organization from Lima led by architects and sociologists tries to recover the street for the people, using urban micro-interventions in a mega-city with a chronic lack of public spaces. The Peruvian capital has grown from 1 million inhabitants in the middle of the last century, to over 10 million today. This is due to the massive domestic migration from the rest of the country - mostly peasants escaping from poverty - and, in the 1980s and 1990s, the violence of the internal warfare. But this growth hasn’t been matched by sufficient urban planning. So, the city has become an example of uncontrolled expansion. The lack of public spaces is just one of the problems associated with it. These spaces are limited almost exclusively to small and scarce parks at best. Districts are a seamless succession of houses and roads. That’s why in December 2014, during the COP20 World Summit about climate change held in Lima, Ocupa Tu Calle (Occupy Your Street) was born. It is a branch of Lima Cómo Vamos (Lima How Are We Going), a citizen organization that reports on urban issues like building-quality and sustainability. It started with a simple project: the installation of a parklet (a sidewalk extension to create a public space) with a pair of tables, chairs, a bench or some planters. Everything was made of discarded building material (pallets, planks and wooden cable spools) in the parking lot of a supermarket in the fancy Miraflores district. “The plan was that it would be there for a few days, until a neighbour would complain about it, but two years later it’s still in place”, explains Belen Desmaison, town planner and Occupy Your Street coordinator. In spite of the simplicity and the small size of this initial intervention, “it was a great success”, she adds. “Better public spaces mean a better quality of life. For instance: less visual pollution, less traffic – as around the public areas the traffic and the speeds go down –, the play areas provide better quality of life for children, the security improves because these spaces are continuously used by families and the crime rates decline”, says Desmaison. The initial success caught the eye of other districts of the city, and they asked the organization to help them make installations in their zones. In some cases, the neighbors themselves looked for them. After two years of work, Occupy Your Street has created 13 spaces. Some of them are parklets (extensions of the sidewalk over an on-street parking space that serves as a small public park), others are play areas, benches with planters or a small plaza. “We use free land - from empty lots to underused parking facilities. In any case, they are always small spaces, no more than 30 or 40 square meters”, claims Desormais, who defines their work as “urban acupuncture”. “We cannot take down a building or a house to provide more public spaces. We work on what is available, on urban leftovers that we exploit and make the most of”. In their work, they involve more than the mere district authorities. They also look for the neighbours' engagement of the neighbours, who are asked about their necessities and have to approve the project. The operational phase is carried out by teachers from the Pontifical Catholic University of Peru (PUCP, in its Spanish acronym), who make preliminary studies, design the project and, afterwards, monitor the impact of the result. “We take a sample of the usage of it along a regular week, watching how many people sit down there, or what kind of activity is performed in it, for how long they stay, what kind of person goes there (families or single persons)… This way we can quantify and prove the positive impact”, indicates an organization coordinator. Finally, Occupy Your Street appeals to private companies interested in consolidating their relationship with the population in the zones the are operate for the donation of the necessary supplies. 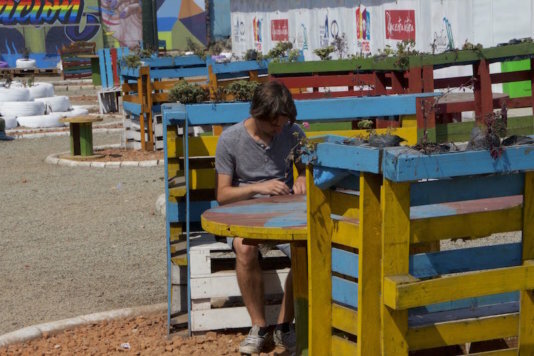 The materials are mostly recycled stuff: Tyres, pallets, wooden boxes… This way, says Desmaison, besides the reduced cost and the low environmental impact, “we provide public spaces that eventually can be easy to repair or reformulate. This kind of material gives us the sufficient degree of flexibility to further improve the space”. In one of their latest projects, a play area in Kennedy Park (in the north of Lima) next to some soccer fields, Occupy Your Street decided to go a step further in the neighbours’ participation process: They held an ideas competition for architecture students, who submitted their proposals, with the neighbours voting on the winner. Given the good outcome of the experience, they expect to apply it in further interventions, though this case was special because of the neighbourhood’s high engagement from the very beginning. They directly asked for the intervention of Occupy Your Street in an attempt to avoid the building of a big shopping mall in the corner of the only park in their area. But that’s not a usual behaviour: “Most of Lima’s inhabitants lack the consciousness of public space. People in this city don’t claim their right to the street”, points out Pedro Vargas, sociologist and coordinator of a PUCP university grade about Public Spaces for future architects. “In people’s perception, the public space is only the park as a recreative and close area, and they don’t realise that the street is the essential element in the citizen life”, he regrets as supervising the building of a bus stop in a bustling and chaotic avenue in Rimac district, very close to Lima center. The stop, an unusual element in the city despite the hundreds of bus lines covering it, is made with pallets, wooden boxes for the benches and planters, and an awning to provide shade in the summer months. “As this is an important avenue with a lot of traffic, and in the night is an insecure zone, we wanted to improve it, to make an ecological stop with plants, seats… to generate a pleasant space. This means to be not only a place where people can be more comfortable but also a meeting point”, explains Chiara Trozzo, junior coordinator in the International Cooperation Italian agency, that collaborates in this micro-intervention. The modest infrastructure is so unusual in Lima that they put a small banner in it inviting: “You can sit down, it's free”. 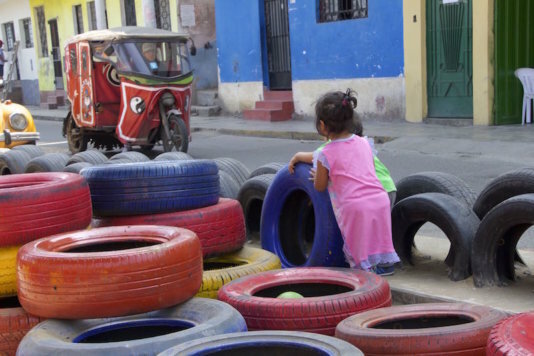 “That’s why this kind of projects aims to generate the awareness of the right to the city: Make people realize that the street is valuable and so, why cede it to the cars?”, Vargas asserts. Jorge Fernández is a 21-years-old student who came to live in Lima from a city in the north of Peru and participates as a volunteer in a project to build an abandoned lot full of garbage in a play area. He was shocked by the lack of public spaces in his new city: “Life in Lima is very hectic, the traffic is very heavy. If you add to that the lack of green areas, it’s a problem for our health and there is no leisure here. We have a grey life”, he exposes while polishing a pallet. “I think that this is a very good project. Making more public areas available, people will be encouraged to leave their homes more often”, he adds. A play area made by Occupy Your Street in an abandoned lot. Is placed in a shanty town with no public spaces at all. 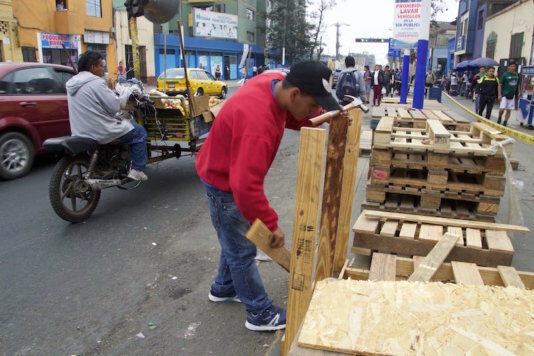 A volunteer prepares pallets to build a bus stop in a bustling avenue. The finished bus stop after the intervention of Occupy Your Street. Integration Plaza. This was an empty lot until Occupy Your Street converted it in a plaza. Integration Plaza. This was an empty lot until Occupy Your Street converted it in a plaza. 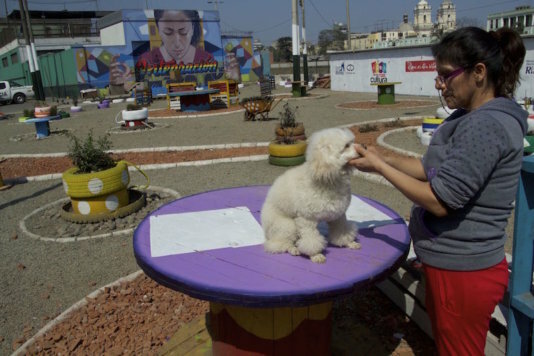 A woman shears her dog in one of the tables of the place. What solid proof of nationality can any individual attempting to migrate really provide?